This article describes the differences between Green/Blue deployments, A/B testing and Canary releases. 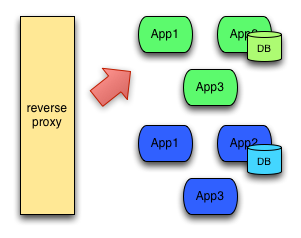 Please see Martin Fowler’s link about blue-green deployments. It gives the overall gist. It’s basically a technique for releasing your application in a predictable manner with a goal of reducing any downtime associated with a release. It’s a quick way to prime your app before releasing, and also quickly roll back if you find issues. A/B testing is NOT blue-green deployments. I’ve run into groups that mistake this. A/B testing is a way of testing features in your application for various reasons like usability, popularity, noticeability, etc, and how those factors influence the bottom line. It’s usually associated with UI parts of the app, but of course, the backend services need to be available to do this. You can implement this with application-level switches (ie, smart logic that knows when to display certain UI controls), static switches (in the application), and also use Canary releases (as discussed below). The difference between blue-green deployments and A/B testing is A/B testing is for measuring functionality in the app. Blue-green deployments are about releasing new software safely and rolling back predictably. You can obviously combine them: use blue-green deployments to deploy new features in an app that can be used for A/B testing. 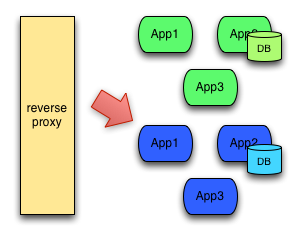 Are there scenarios where canary release is preferred over blue/green deployments, and vice versa? Blue-green releasing is simpler and faster. You can do a blue-green release if you’ve tested the new version in a testing environment and are very certain that the new version will function correctly in production. Always using feature toggles is a good way to increase your confidence in a new version, since the new version functions exactly like the old until someone flips a feature toggle. Breaking your application into small, independently releasable services is another since there is less to test and less that can break. You need to do a canary release if you’re not completely certain that the new version will function correctly in production. Even if you are a thorough tester, the Internet is a large and complex place and is always coming up with unexpected challenges. Even if you use feature toggles, one might be implemented incorrectly. Deployment automation takes effort, so most organizations will plan to use one strategy or the other every time. So do blue-green deployment if you’re committed to practices that allow you to be confident in doing so. Otherwise, send out the canary. The essence of blue-green is deploying all at once and the essence of canary deployment is deploying incrementally, so given a single pool of users I can’t think of a process that I would describe as doing both at the same time. If you had multiple independent pools of users, e.g. using different regional data centers, you could do blue-green within each data center and canary across data centers. Although if you didn’t need canary deployment within a data center, you probably wouldn’t need it across data centers.